Knows what LaetusAtheos means.351-400 -because I always get asked. Corbu is my homeboy 751-800 -Le Corbusier is a famous architect who is an atheist; my cat is named after him. Re: What are the User Ranks? 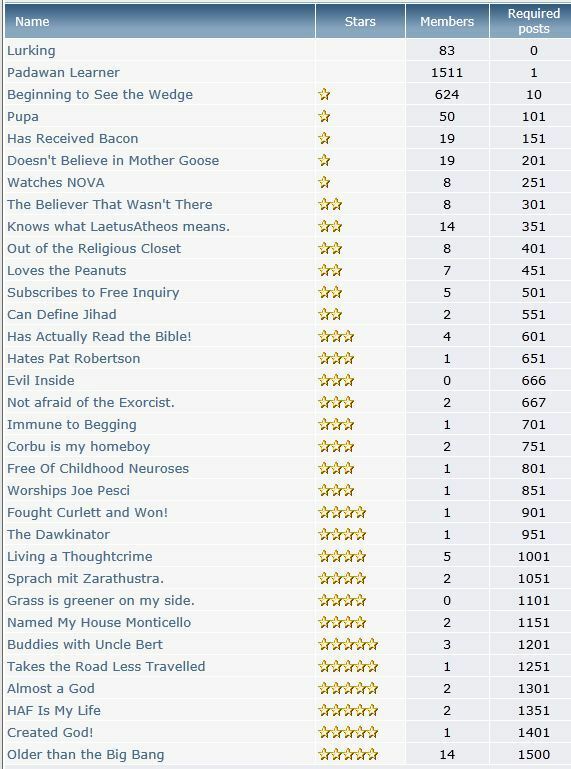 I think "Hates Pat Robertson" deserves more than a 15 post range. Fixed Padawan Learner to coincide with graduation to full board at 50 posts. Everyone, feel free to think of new ranks for past the 1500 range. How about a personal rank over 2000? How about "Too Awesome for a User Rank"? Apologies if this has been suggested before. At Venganza, when a poster reaches an extremely high number of posts (in that case, the goal is 5,000), they are voted their own custom Prophet title. Nominations are taken from the membership and then voted on. The [strike:r3auc6w7]victim's[/strike:r3auc6w7] recipient's opinions are welcomed, and occasionally even given a measure of consideration. This has produced some rather interesting and usually hilarious results. This is the current user rank set up. At the moment we can't do custom ranks so don't ask please. However I'd like to add some more differentiation for post counts less than 100 and particularly the 1 to 9 ranks. Was god's anointed but took a shower. Touched by His Noodly Appendage! I'd like to be "a frood who really knows where his towel is." Knows what six times seven equals. Knows what the question is. Thanks, Tank. Not far to go now. Well, suggestions for new ranks please. Touched by His Noodly Appendage - respectfully capitalised.